This is an immense honor, and beyond words, I feel so blessed to follow in Rachel Carson’s footsteps. As a recent survivor of breast cancer and someone who tries every day to carry on her legacy, this raffle win means SO MUCH to me. I just read Bob Musil’s description of staying at the cottage. I’d like to write a similar testimonial for your website. Let me know if I can do or say anything else to promote your good work. And thank you!!! I am going to have chills the whole time I am there. … This will be a much needed break from otherwise working on the issues facing Pittsburgh and our region these days. My wife and I will probably never forget Sunday, January 1, 2018. After returning home from worship we were concurrently checking voice messages and emails. We both shrieked with joy almost simultaneously as we learned that we had won the raffle to spend a week at Rachel’s Carson’s cottage on the Maine coast! Our overwhelming gratitude and enthusiasm for this opportunity have only grown since that moment of initial elation! Later on New Year’s Day, we invited two dear friends to join us in Maine. They happen to be equally passionate environmentalists who had visited Rachel Carson’s Homestead with us in September 2017 when we bought our raffle ticket. As the weeks progressed, our sense of wonder and anticipation over spending a week in Rachel’s cottage grew by leaps and bounds! A month before leaving for Maine, the owners answered all of our questions and provided invaluable tips for our visit to Booth Bay Harbor and Southport Island! As we drove up the natural rocky driveway to the cottage in our SUV that July afternoon, we soon discovered that the cottage is a heavenly place with a fantastic light-filled great room, a very functional kitchen, four right-sized bedrooms, and a spacious deck with incredible views of the Sheepscot River…. And, then there is Rachel’s study … When I entered it the first time, it left me speechless and choked up with emotions as I realized that I was standing in the space where she had written Silent Spring, a book which had changed the world!! When we wandered onto the deck for the first time, we wondered what adventures we would experience there during the days to come. It quickly became our favorite spot for breakfast, lunch, afternoon tea with cheese and crackers, frequent chats, and simply relaxing! The deck provided a place to sense the sights and sounds of the River! Osprey quickly made their presence known with their unique chirpy call! Although we heard more of them than we actually saw, one midday I observed four osprey flying high overhead. One evening, a huge owl flew by the deck chased by a very vocal angry bird! We heard the melodic calls of the wood thrush in the forest surrounding the cottage! We saw or heard gulls, families of ducks, lots of other birds, and some otters! The deck became a great spot to watch sunsets and sunset reflections over the River! Two of us even stayed up well beyond midnight taking pictures of the moon and its reflection as it set across the Sheepscot! It didn’t take long for our fascination with the River to lead us down the hill toward the water for the first time … we wondered what we might discover along that rugged rocky granite shoreline, We were soon drawn to its mesmerizing tides, the multitude of tidepools, its everchanging incredible views, and its soul refreshing solitude! We all took walks across the rocks, sat on boulders, observed the ducks and gulls, and were awed by the glorious sunsets over the river. And of course, the rocks were the ideal spot to watch lobster boats approach a buoy, reel in a trap, remove a few lobsters, toss others back into the water, return the trap to the sea, and accelerate off to the next trap. The lobster boat sputter and varoom sounds soon became unmistakable! For me, the shore unexpectedly became my place of refuge and spiritual renewal where I spent hours walking alone, taking pictures, observing the tides and birds, soaking in the views and the sunsets, listening to the bird calls and the soothing sounds of the waves, just sitting to meditate and pray, thinking about the significance of Rachel’s world transforming life, and considering the challenges of the social justice work which consumes much of my time. As we discussed how to spend our week, we wondered what opportunities the area might provide. Each time we drove to town, we crossed the “swinging” bridge which rotates on a support structure to allow taller boats to pass through the channel. For tourists, it is quite a treat to watch, even though it holds up traffic for a few minutes. For locals and the resident ospreys who nest on top of the bridge, it must be quite annoying! We had a great time exploring the picturesque Booth Bay Harbor business district and enjoyed delicious meals, bowls of scrumptious clam chowder, and ice cream snacks there!! One morning we took a neat hike on the Norman Van Horn Trail, one of many Booth Bay Land Trust trails in the vicinity. 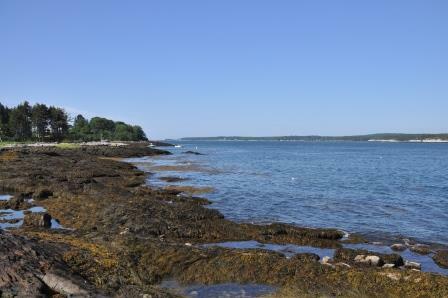 We thoroughly enjoyed the Maine State Aquarium, the Coastal Maine Botanical Gardens, and a whale watch. One day for lunch we attended the bazaar at the Southport United Methodist Church for overflowing “lobstah” rolls, sweets, and great conversation with some local residents. Since all four of us really like Maine seafood, we wondered how many seafood meals and lobster rolls we could possibly squeeze into one week!! Based upon Wendy’s recommendations, we visited Pinkham’s Seafood Market twice to purchase scallops and we all agreed that they were THE BEST and SWEETEST scallops we had ever tasted!!! Robinson’s Wharf next to the “swinging” bridge spoiled us with delightful dinners of fresh lobster, perhaps ones caught by a boat we watched on the River!!! When we first arrived, we wondered what we might learn about Rachel and her work. Our first clue occurred when we noticed the June 1992 issue of Down East magazine in the cottage and read the fabulous articles which focused on her life and her work. On the only rainy, foggy day of our week in Maine, we decided to drive around Southport Island to see the sights. As a deluge began, we stopped at the fascinating Southport Library which has an impressive collection of Rachel’s writings and books about her work! The walls of the main room are filled with paintings which are accompanied by inspiring Rachel Carson quotes, many of them from her book The Sense of Wonder! During our week, we met quite a few Southport Island residents who spoke so affectionately about Rachel and who are friends with Wendy and Roger! Those conversations added immeasurable richness to our visit to the area! It was virtually impossible to miss the aura of Rachel’s presence on the island! Since leaving Southport Island, I have wondered what my most vivid memories of our week at Rachel’s cottage would be!